Net Neutrality is the most important issue of our lifetime. The Christian Coalition and the Gun Owners of Society want net neutrality. The Tea Party however calls it Gov'ment regulation and Glenn Beck says its a "Marxist takeover of the internet." What more evidence do we need that the so-called "Tea Party" is just a corporate managed public relations sham. The worst thing for a small, very dispersed population of citizens is to allow large corporate Internet Service Providers to create tiers of internet service and charge for speed. If your small group can't afford the high speed lanes, anyone who goes to your site will have to download your site's contents on the slow lane. As a business model, this will add extra costs to small businesses who will have to pay for the high speed lanes in order to remain competitive. For those of you who are ignorant about net neutrality, here is a summary. Right now the speed of the internet is dependent only upon you computer speed and your download mechanism -- whether you use a Cable modem, an old Telephone Modem, or some other type of DSL connection. Customers already pay for broadband service to access the internet, and for an internet connected Server where web-sites files are located. The signals that get sent into wireless domain or onto fiber optics lines bounce off antennae or travel through different parts of the network based on density and speed of availability. The signal speed is the same for all signals that criss-cross this mixture of transportation mediums (wireless, cable, or land-line). What corporations like Google and Verizon want to do is something else. Basically, they will place a header on all broadband signals emitting from customers on their servers that will determine the speed of the signals, or which lane the signals go. This is something other than Bandwidth, which customers already pay for. Bandwidth is how many MegaBytes or GigaBytes your server will release per month (sometimes even per day) to anyone who accesses your site. There is no economic reason or greater efficiency benefit which merits creating different speeds of internet signals. This is just another way that corporations redefine the world in order to siphon more money from the citizens of the country where they operate. This is exactly what institutions do when they get large enough to have power over some critical component of the economic infrastructure. Rachel: "Fox News ... consistently runs stories it says are news, but that nobody else really covers. Stories that are ginned up, exaggerated, caricatured, in some cases flat-out made-up scare stories designed to make white people feel afraid of black people. Designed to make it seem like black people -- or in some cases immigrants -- are threatening white people and taking what is rightfully theirs. You may not like that diagnosis of what Fox has been up to, but to say there's no evidence -- not 'a shred of evidence,' as he said -- that's bullpucky." Some of you might not know why this vote had to go through the 2/3rd's reconciliation process. The reconciliation process is a way to pass legislation through the Senate without Filibuster and streams of Amendments. For a majority vote to happen, Amendments have to be allowed on the floor, and this Amendment process has been used by the Republicans like an automatic machine gun of often superfluous quality in order to delay and slice up the very legislation being voted upon. In years past, this type of political distortion of the majority vote was no where near what the Republicans are now doing. Right now, the Republicans have blocked 55% of Obama's lower level judical and bureaucratic appointments. This is the most in the last 5 presidents by far, with the percentage being from 10% to 30% from Carter to GW Bush. They offer nothing but obstruction and obfuscation, and their latest "Save the Deficit" proposal offered by Senator Ryan didn't even ask the CBO to assess the affect of the various tax reduction schemes for corporations and the upper 1% of the wealthy ... because despite the plethora of historical evidence to the contrary, Ryan makes the false assumption that tax decreases pay for themselves -- something that even Alan Greenspan and the oft-cited Republican demi-God Milton Friedman deny. Tax decreases cannot and do not automatically get directed towards investment. Most of the recent tax cut to the upper 1% went into savings, and was thus outsourced into speculative or foreign markets seeking a high return. That is not the same thing as creating businesses and economic wealth in the communities across the United States. Krugman is all over this in a recent New York Times Column. You should check out what he also says on his blog. Here is a link for the Tax Policy Center. 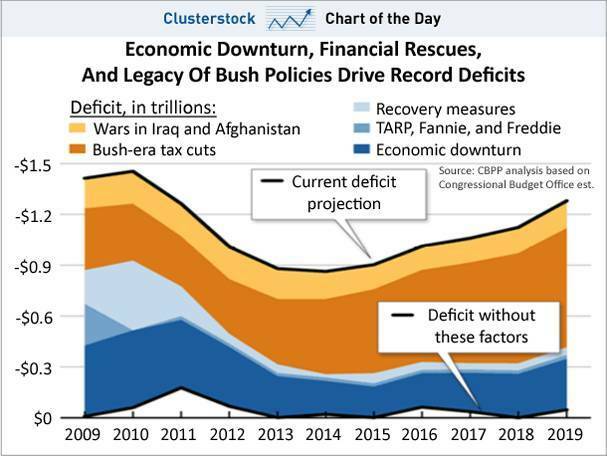 Here is a link about the 5 Myths about the Bush Tax Cut at the Tax Policy Center. Yep, that's right, we don't have a deficit because of entitlements and social-spending or loans to foreigners. Nope, it's because of the the 3 colored strata: yellow, golden, and dark blue. Wars, tax-cuts to the wealthy, and the economic downturn. And the tax-cuts are more than the other two put together. Click here for the long version (with footnotes) of the budget analysis by the CBPP (Center on Budget and Policy Priorities). Here is New York Congressman Anthony Weiner getting upset at Republican hypocrisy. The issue is whether to include 9-11 Emergency Responders under the Government Health-care provisions. Rather than voting outright "no", Weiner watches as Republican after Republican repeatedly whine about the awful procedure, standing that they want to vote "yes" but they have principles and can't do so under the current procedure. Seriously, I'd be pissed too. UPDATE: Oh, I forgot another thing about this incident. Jon Stewart had a piece on it that I will post above, but here is the skinny: in order to pay for this the Democrats were going to rescind tax breaks for any corporation that uses the Cayman Islands as a Post Office location in order to avoid paying income taxes on their revenues and pay-rolls. The Republicans called this a tax increase. The Republicans said that voting for a tax increase at this time would be bad for the economy and bad for middle class Americans trying to struggle during these hard times. Yes, that's right, these same Republicans who could not vote for 26 more weeks of unemployment for those same struggling middle class Americans only just last month, decided to call taking away tax subsidies from American corporations who are openly breaking the law by using a foreign post office as a means of circumventing taxes. When you discover that a belief you held has no basis of truth, you can either toss the belief into the trash bin of bad ideas, or you can insist that your beliefs are still true. However, once you go down the path of believing things without the requirement of logical consistency, the distance between reality and what you perceive to be reality increases. You evolve into something you do not really understand, a creature with a stunted feedback loop, ignoring evidence to the contrary. If this persists, after a period of time, the distance gets to the breaking point, like a rubber band. When the breaking point is reached, if you finally let go of the falsity, the energy is released, and everything comes crashing down at once. But if you instead still insist on your own version of truth, the rubber band snaps, and you are broken beyond repair, welded permanently to a frozen paradigm and instinctive delusions that will forever incessantly protect the self without the self even being aware of its own actions.